The unusual subject of this painting comes from one of Aesop's fables. In his Man and the Satyr, he related how a demigod helped a peasant who was lost on a wintry day. When the mortal put his chilled fingers to his mouth to breathe warmth onto them, the immortal satyr was astonished. Later, in thanks for the satyr's guidance, the peasant invited him to eat. The soup being hot, the man blew on his spoon to cool it. Johann Liss portrayed the tale's climax when the satyr jumps up in disgust, proclaiming, "From this moment I renounce your friendship, for I will have nothing to do with one who blows hot and cold with the same breath" -- the moral being that all humans are hypocrites because they inconsistently blow hot and cold. Johann Liss was among the initiators of the dynamic baroque style of the 1600s. The sonorous color scheme shows his knowledge of past Venetian masters such as Titian and Veronese, while the dramatic conflict of light and shadow reveals an acquaintance with the spotlighting which Caravaggio concurrently employed in Rome. But the main influences here are the energized movement and robust figure types derived from the contemporary Antwerp geniuses, Jacob Jordaens and Peter Paul Rubens. Aron de Joseph de Pinto [d. 1785], Spain and The Netherlands, by 1780. Lopes Leao de Laguna, The Netherlands. (Leo Nardus [1868-1955], Suresnes, France, and New York); sold 1897 to Peter A.B. Widener, Lynnewood Hall, Elkins Park, Pennsylvania; inheritance from the Estate of Peter A.B. Widener by gift through power of appointment of Joseph E. Widener, Elkins Park; gift 1942 to NGA. Catalogue of Paintings Forming the Private Collection of P.A.B. Widener, Ashbourne-near Philadelphia. Part II. Early English and Ancient Painting. (1885-1900), 270, no. 270. The painting is not listed in the catalogue of the de Pinto sale, Amsterdam, Van der Schley & Yver, 11 April 1785; letter of 16 December 1988 to John Hand from Gerbrand Kotting, Rijksbureau voor Kunsthistorische Documentatie, The Hague. Johann Liss, Rathaus, Augsburg, Germany; The Cleveland Museum of Art, 1975-1976, no. A10. The support is composed of six pieces of linen sewn together. The main body of the painting is formed by two pieces with a vertical seam just left of center, while four small pieces of fabric, 9 cm in height, are joined in a narrow strip across the top of the painting. The plain-weave linen is of medium-fine threads, unevenly spun, and is moderately tightly woven. Although the original tacking margins are no longer extant, presumably only a very small amount was removed and the painting is close to its original size. The ground is made up of two layers, a thick red lower layer and a thin black upper one. 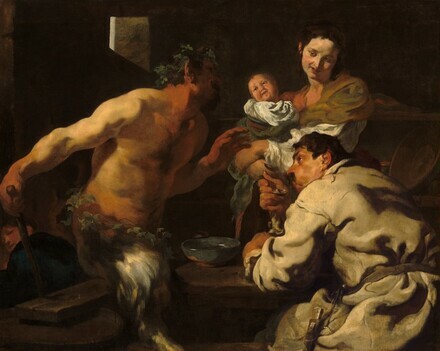 The few pentimenti that are visible indicate minor adjustments in contours: the peasant's hair was extended farther out at the front, the bottom of the mother's right cheek was made fuller, and the lengths of one finger each on the satyr's left and child's right hand were altered. There are scattered losses in the ground and paint layers near the edges and along the tears, with a few along the top horizontal seam, and small losses elsewhere. There is extensive and disfiguring abrasion throughout. The impasto in the areas of white paint, such as in the infant's dress and the mother's sleeve, has been flattened by previous relinings. There are several long tears in the support: on the child's forehead, at the center of the satyr's chest, on the peasant's arm, and between the peasant's arm and body; these have been mended and are now aligned and in plane. Catalogue of Paintings Forming the Collection of P.A.B. Widener, Ashbourne, near Philadelphia. 2 vols. Paris, 1885-1900: 2 (1900): 270, no. 270, repro. Mather, Frank Jewett. "Art in America." The Burlington Magazine 10 (January 1907): 269. Peltzer, R. A. "Liss." In Thieme-Becker. 37 vols. Leipzig, 1907-1950: 23 (1929):286. Mayer, August L. "Notes on Spanish Pictures in American Collections." Art in America 3, no. 6 (October 1915): 316. Berenson, Bernard, and William Roberts. Pictures in the Collection of P.A.B. Widener at Lynnewood Hall, Elkins Park, Pennsylvania: Early Italian and Spanish Schools. Philadelphia, 1916: unpaginated, repro., as The Satyr and the Traveller, attributed to Velasquez. F. "Aus der Sammlerwelt und vom Kunsthandel." Der Cicerone 8 (1916): 40. Oldenbourg, Rudolf. "An Unidentified Picture by Jan Lys." Art in America 4 (1916): 53-58, fig. 1. Borenius, Tancred. "Jan Lys." The Burlington Magazine 33, no. 187 (October 1918): 115. Oldenbourg, Rudolf. "Gemäldegalerie. Neues über Jan Lys." Amtliche Berichte aus den königlichen Kunstsammlungen 39, no. 6 (März 1918): 114. Bode, Wilhelm von. "Johan Lys." Oelhagen & Klasings Monatshefte 33 (1920): 172-173, repro. Oldenbourg, Rudolf. Sei e Settecento Straniero. Jan Lys. (Biblioetca d'arte Illustrata, serie I, fascicolo 7.) Rome, 1921: 10, 15, pl. 17. Paintings in the Collection of Joseph Widener at Lynnewood Hall. Intro. by Wilhelm R. Valentiner. Elkins Park, Pennsylvania, 1931: 44-45, repro. Tietze, Hans. Meisterwerke europäischer Malerei in Amerika. Vienna, 1935: 336, no. 160, repro. (English ed., Masterpieces of European Painting in America. New York, 1939: 160, repro.). Brimo, René. L'Evolution du Goût aux Etats-Unis d'après l'histoire des collections. Paris, 1938: 117. Waldmann, E. "Die Sammlung Widener." Pantheon 22 (November 1938): 340-341. Valentiner, Wilhelm R. "Willem Drost, Pupil of Rembrandt." The Art Quarterly 2, no. 4(Autumn 1939): 322. Waterhouse, Ellis K. "Review of L'Evolution du goût aux Etats-Unis d'après l'histoire des collections by René Brimo." The Burlington Magazine 75, no. 437 (August 1939): 86. Steinbart, Kurt. Johann Liss. Berlin, 1940: 173-174. Valentiner, Wilhelm R. "Jan van de Cappelle." The Art Quarterly 4 (Autumn 1941): 289. Works of Art from the Widener Collection. Foreword by David Finley and John Walker. National Gallery of Art, Washington, 1942: no. 5. Paintings and Sculpture from the Widener Collection. National Gallery of Art, Washington, 1948 (reprinted 1959): 35, repro. Pigler, Andor. “Der Satyr bei dem Bauern.” In Barockthemen: eine Auswahl von Verzeichnissen zur Ikonographie des 17. und 18. Jahrhunderts. 2 vols. Budapest, 1956: 2:324. Steinbart, Kurt. "Das Werk des Johann Liss in alter und neuer Sicht." Saggi e Memorie di storia dell'arte 2 (1959): 168-170, 204, fig. 13. Walker, John. National Gallery of Art, Washington, D.C. New York, 1963 (reprinted 1964 in French, German, and Spanish): 309, repro. Kühnel-Kunze, Irene. “New ‘Old Masters’ for the Picture Gallery.” Apollo 80 no. 30 (August 1964): 108. Cooke, Hereward Lester. Galeria Nacional de Washington. Translated by Maria Teresa de la Cruz. Madrid, 1965: 23, repro. Klessmann, Rüdiger. "Ein neues Werk des Johann Liss in der Berliner Gemäldegalerie." Nordelbingen 34 (1965): 83. Summary Catalogue of European Paintings and Sculpture. National Gallery of Art, Washington, 1965: no. 80. "Rijksmuseum Amsterdam. Verschillende Verzamelingen." Verslagen der Rijksverzamelingen van geschiedenis en kunst 89 (1967): 98. European Paintings and Sculpture: Illustrations (Companion to the Summary Catalogue, 1965). Washington, 1968: 70, no. 635, repro. Pigler, Andor. “Der Satyr bei dem Bauern.” In Barockthemen: eine Auswahl von Verzeichnissen zur Ikonographie des 17. und 18. Jahrhunderts. 3 vols. Rev. ed. Budapest, 1974: 2:340. Blankenagel, Gabriele. "Johann Liss." Weltkunst 45, no. 17 (1. September 1975): 1,361. European Paintings: An Illustrated Summary Catalogue. National Gallery of Art, Washington, 1975: 206, repro. 207. Rowlands, John. "`Johann Liss' at Augsburg." Review of Johann Liss; Ausstellung (Augsburg 1975). In The Burlington Magazine 117, no. 873 (December 1975): 835. Safarik, Eduard A. "La Mostra di Johann Liss." Review of the exhibition Johann Liss, Cleveland 1975. In Arte Veneta 29 (1975): 303, no. A10. Bean, Jacob. "Johann Liss (and Peolo Pagini)." Master Drawings 14, no. 1 (Spring 1976): 65. Butler, Joseph T. "America." The Connoisseur 193, no. 776 (October 1976): 147. “Liss-Werk in USA entdeckt.” Ostholsteiner Nachrichten / Neustädter Tageblatt / Ostholsteinische Kreis-Reundschau nr. 213 (19. September 1976): 3, repro. Spear, Richard E. "Johann Liss Reconsidered." The Art Bulletin 58, no. 4 (December 1976): 586, 588, 590-591. Shapley, Fern Rusk. Catalogue of the Italian Paintings. 2 vols. Washington, 1979: 1:290-293, no. 635, 2:pl. 206. Pallucchini, Rodolfo. La Pittura Veneziana del Seicento. 2 vols. Milan, 1981: 1:144, 2:605, fig. 397. Walker, John. National Gallery of Art, Washington. Rev. ed. New York, 1984: 232, no. 299, color repro. (as by Jan Lys). Klessmann, Rüdiger. "Addenda to Johann Liss." The Burlington Magazine 128 (1986): 192. National Gallery of Art, Washington. National Gallery of Art, Washington, 1992: 72, color repro. Hand, John Oliver, with the assistance of Sally E. Mansfield. German Paintings of the Fifteenth through Seventeenth Centuries. The Collections of the National Gallery of Art Systematic Catalogue. Washington, 1993: 121-126, color repro. 123. Klessmann, Rüdiger. "Johann Liss's "Temptation of the Magdalen'." The Burlington Magazine 138, no. 1,116 (March 1996): 187, 188, 189. Klessmann, Rüdiger. "Liss [Lys], Johann." In The Dictionary of Art (33 vols.) New York, 1996: 19:472. Klessmann, Rüdiger. Johann Liss: A Monograph and Catalogue Raisonné. Translated from the German by Diane L. Webb. Doornspijk, 1999: 22, 37, 49-50, 60, 79, 113, 147-149 no. 17. Klessmann , Rudiger. “Liss.” In Allgemeines Künstlerlexikon: die bildenden Künstler aller Zeiten und Völker Unfinished set. Berlin, 1995- : 85:56.